Are the Girls from Run’s House in Lauren’s Old “Hills” Apartment? So I would like to classify this news story as “WTF,” “Who Gives a F,” and more importantly, “I’m a Loser.” Now that that’s settled, has anyone been watching the new season of “Run’s House” on MTV? Like the TV tool bag I am, I’ve been watching. 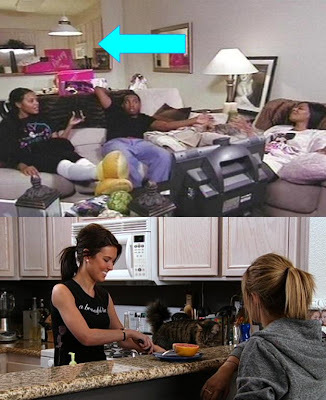 Did anyone else notice that the LA apartment that the girls (Vanessa and Angela) now live in looks just like Lauren and Audrina’s old apartment on “The Hills” a season ago (minus the gray walls)? Well, when you’re life is as sad as mine you notice these things. It’s not like it’s a big deal, but I sorta feel like it’s like I found “Waldo” in a world full of red-striped sweaters. 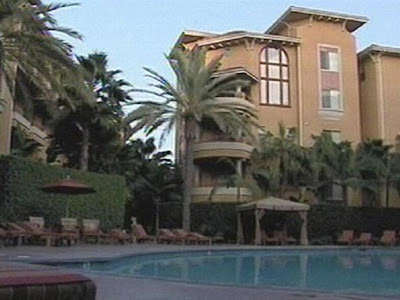 Even the outside of their apartment complex looks a lot like that of good old douche-bag Lauren’s old stomping grounds. All I really have as proof is some of these photos from the show, my cutting and pasting skills, a bright blue arrow, and my memory….oh, and my loserishness. I was waiting to see Heidi’s mom’s “special painting” up against the wall at any second. Maybe Heidi’s old dog and Lauren’s old cat still live there. Either way, I’ll be looking for them. Anyone? Anyone? Cricket. Cricket. Cricket.